● Improvements on Bereavement Leave. We will return to the bargaining table May 10th & 11th. Please be aware of the Strike Authorization Vote taking place throughout DIRECTV in California and Nevada Locals throughout District 9. A strong strike vote lets AT&T know that DIRECTV members are prepared to do whatever it takes to get a good contract and gives your bargaining committee the support we need at the bargaining table. Please contact your CWA Representative for more information. Results will be announced once completed and tallied. As a reminder, please make plans to join us at the San Jose, CA rally on April 9th. 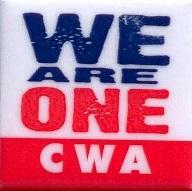 CWA National President Chris Shelton will be in attendance. Contact your CWA Representative for more information. Click here for details about the Rally.